A full moon rises over Hogwarts castle, gleaming through menacing clouds in a darkened sky. 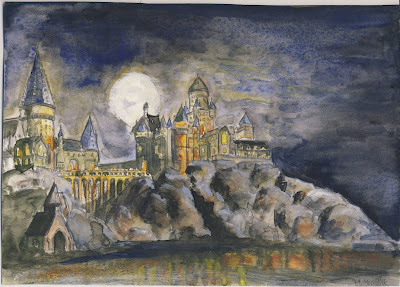 While learning to use watercolors in college I created this watercolor painting of Hogwarts Castle from Harry Potter. One technique for painting landscapes is to take a picture or multiple pictures and then translate a combination of those images into a painting. In this case I found a picture of the castle from the movie online and used it as a reference. I did not trace the image, but I did sketch it in pencil first, then add the watercolors. I think it was a good learning experience.